The phenomenal growth of Chinese economic and military power in the first decade of the 21st century has drawn world-wide attention. Perceptions of China's rise have shifted from seeing China as a threat to a more mixed view, where China is seen as playing a key role in economic recovery, taking an increasingly responsible role in world affairs, and contributing significantly to scientific and technological advances. This book argues that China will only become a truly global power when its rising power status is accepted, or at least tolerated, by other major powers and China’s neighbours. Filling a major gap in the existing literature, it presents a comprehensive overview of how China's rise is perceived in a wide range of countries and regions – these include China's neighbours, other world powers, the parts of China not part of mainland China - Taiwan, Hong Kong and Macau - and regions of the world where China is having an unexpected impact, such as the Middle East. It also examines changing perceptions of China in the western media. 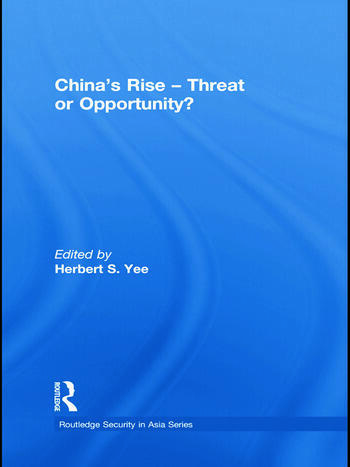 Overall, the book demonstrates that whilst many countries and regions are much more positive about China's rise than they were before, considerable nervousness and concern persists. Herbert S. Yee is currently Visiting Professor of Politics and International Relations at the Macau Polytechnic Institute, China, and former Professor in the Department of Government and International Studies at Hong Kong Baptist University. His recent publications include (as co-editor) The China Threat: Perceptions, Myths and Reality (also published by Routledge) and Return of the Dragon: US-China Relations in the 21st Century.